Interested in learning some practical self-defence skills? Most of us would like to be better equipped, just in case. At this community event, no matter what your skill-level, you’ll be shown some helpful techniques. This will include the opportunity to get to know a friendly martial arts training community, and to get deeper into training, if it turns out to feel right for you. 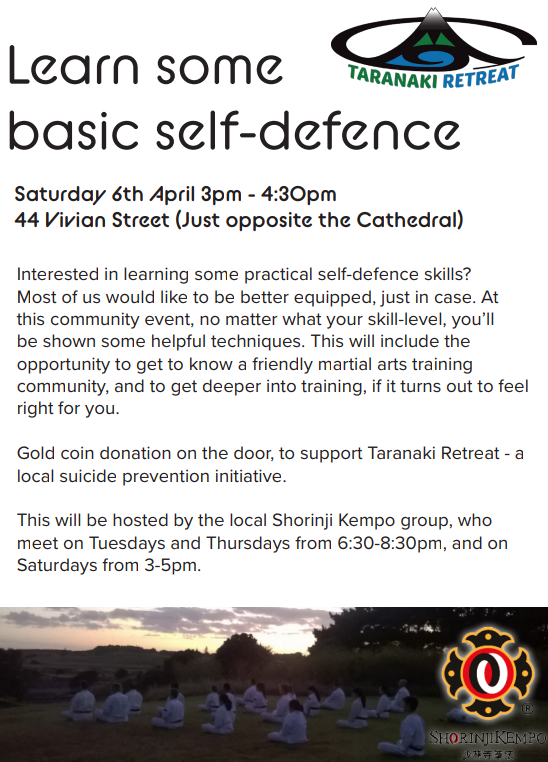 Gold coin donation on the door, to support Taranaki Retreat - a local suicide prevention initiative. This will be hosted by the local Shorinji Kempo group, who meet on Tuesdays and Thursdays from 6:30-8:30pm, and on Saturdays from 3-5pm. Anyone aged over 11. A reasonable level of mobility will be required for some of the techniques. Yes! Numbers are strictly limited, so (FREE!) registration is essential. Book your space NOW! Can we come to this as a group? Yes! How about you, plus your whānau/friends - or a group of you from work - it would be a fantastic team-building exercise, doing some a bit different and upping your skills at the same time? I'd like to know more - whom should I contact?